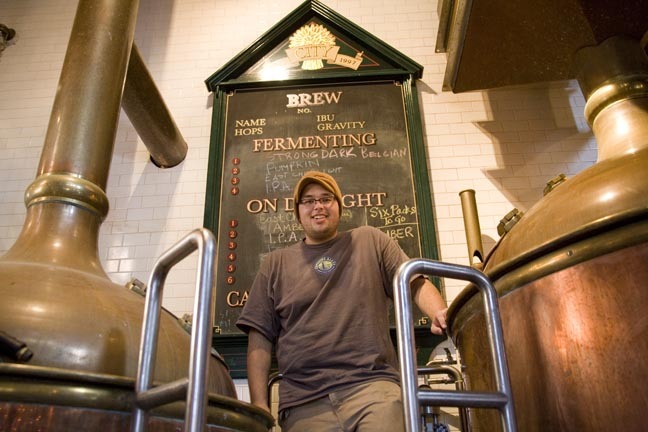 Joe Cleinman straddles two schools of brewing: for him, making beer is a science and an art. Theo Epstein is a walking American dream. Growing up nearly within earshot of Fenway Park, he played, studied and dreamed baseball before the Boston Red Sox hired him as their general manager in 2002. At 28, he was the youngest general manager in the history of Major League Baseball and the envy of little boys — and grown men — nationwide. Baseball may be the American tradition and Mr. Epstein’s job an American dream, but neither the tradition nor the dream would quite say America without an ice cold beer. Offshore Ale in Oak Bluffs, the Island’s only brewhouse, is the perfect spot to tuck away with a beer, baseball season or not. Fresh out of college, Joe Cleinman, 22, has accidentally become the youngest brewer in Offshore’s history and one of the youngest in the country. While his friends are starting graduate school and working their way up the corporate ladder, Mr. Cleinman makes and drinks beer for a living. He suddenly rivals Mr. Epstein for the coolest job in America. Mr. Cleinman had a dream, too. But for the young brewer, it involved beer rather than bats, grain rather than ground balls. Although he pleads the Fifth when asked about underage drinking, he said his interest in beer began in high school and took off when he enrolled at Vassar College in New York. “Freshman year of college, I became very interested in beer,” Mr. Cleinman said with a half smile on a recent fall afternoon. Clad in rubber boots up to his knees, he was peering into a mashtun, a copper, cauldron-like tub in Offshore’s tiny, on site brewhouse set back from the dining room. The beginnings of a new brew, a Belgian ale Mr. Cleinman devised specially for the brewery, churned and steamed inside. As he began recounting his love affair with beer, Mr. Cleinman routinely paused to check the time on his cellphone. It was in his sophomore year at Vassar that Mr. Cleinman first experimented with home brewing. One afternoon, after reading a handful of how-to books, all of which had warned of the disappointment of a first brew, he stood with a friend in his dormitory kitchen, the site of the experiment. The pair crossed their fingers and raised full glasses of oatmeal stout to their lips. Not bad, he thought. Mr. Cleinman paused to pull his phone out of his pocket. “Is it time yet?” asked a bartender, roped in to play assistant for the day. “Nope,” Mr. Cleinman said and shoved the phone back in his pocket. After brewing that first batch, Mr. Cleinman started a home brewing club and began teaching brewing classes on campus. Because it is against the law to sell home-brewed beer, not to mention the legal tangle of selling to underage drinkers, his brewed concoctions quickly piled up in his closet. “I had about 40 bottles in there,” he said. That summer, Mr. Cleinman took a job as a tour guide at Brewery Ommegang, a Belgian ale brewery close to his home in upstate New York. The following summer, they hired him as an intern. He stopped talking again and pulled the phone out. “A lot of the brewing process is just hurry up and wait,” he said. Outside, the day was blustery, cloudy and cool. Inside it was toasty. A blackboard above the mashtun listed the beer on tap — Hop Goddess, IPA, Amber Ale — and from the beer brewing came the smell, a mix of baking bread, brewing coffee and something else, something earthy. It smelled like fall, the season of baseball and beer. Mr. Cleinman said there are two schools of thought when it comes to brewing: it can be seen as a craft or as a science. Mr. Cleinman straddles the line between the two. 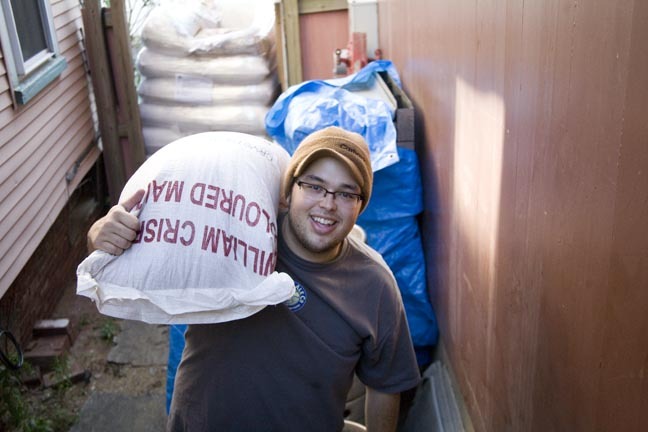 At Vassar, he studied biology and is fascinated by what he described as fermentation science. In college, he learned to make cheese and one semester, a Benedictine monk in Poughkepsie, New York, taught him to make vinegar for credit. Taking advantage, Mr. Cleinman debuted an original Octoberfest last month he named Novemberfest. “It’s a simple, good, approachable beer,” he said. Next comes the pumpkin ale, and then this Belgian ale, a total of three original beers in three months. “It’s a learning process,” he said as he peered through the steam into the hot liquor tank. At 213 degrees, the boiling liquid on its way to becoming beer steamed and bubbled and frothed inside, threatening to spill over and down the sides. Each time, Mr. Cleinman turned on a hose and sprayed back the brew. “Hey, if you trust me to be up here and not burn myself, you can come up and see it,” he shouted down.